Why would I need an exterior sump pump system? In most cases you won’t need an exterior sump pump. This is generally used when homes are built in areas with an underground water source or a naturally a high water table is present. In this case we dig a much larger sump pump pit then you would find in a home. The reason for the larger pit is for a larger water capacity. This keeps the pump cycles to a minimum, optimizing pump longevity and ultimately keeping the water away from your foundation. In almost all applications the exterior sump pit is taking on water year round. The exterior sump pit works like the smaller version installed inside the home. We first determine how much capacity we need and then chose the right size pit and pump. The pit is installed in the best location working with the homeowner since the lid will be the only thing visible we can usually landscape it into the yard. The water is pumped underground from the pit to a carefully picked location ensuring we do not have water being recycled through the system. 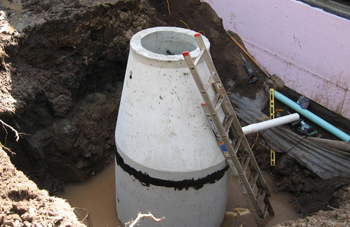 Your sumps discharge line can also be installed into your storm sewer if conditions are right. We install a high level alarm float inside the pit and then install a alarm inside the home. If the pump stops working the alarm will sound and tell you something is wrong. All of our sump pits are always designed to have extra capacity just in case the pump stops working. Basement Pros is the right choice. People build homes anywhere and sometimes they don’t realize water tables can fluctuate during the year. Here at basement pros we have had the opportunity to work in some of the worst conditions a home owner could imagine. Our skilled professionals have the knowledge to fix your water problem right the first time. Basement Pros also uses top of the line products to insure the fix will last. Hydromatic pumps are used in all of our exterior installations. Hydromatic pumps are considered top of the line in the industry and come with a three year warranty.